Jason Derulo's second album is a pedestrian step back. When an album starts with the vocalist singing his own name with cumbersome Auto-Tune, it’s hard to feel enthusiastic about what’s to come. Still, Jason Derulo’s Future History isn’t all bad - it's just mostly bad. The multi-platinum singer’s sophomore record has the bones of some fairly good songs on it, but it is so overproduced and busy it’s hard to track the message. Derulo, now 22, is trying to persuade listeners he’s come a long way since his self-titled debut. He has, in fact, opened for Lady Gaga and the Black Eyed Peas (in Canada). And he does have input in the writing process, even though most of the songs appear composed by committee. Beneath all the twirling synths, Auto-Tuned vocals, hectic backgrounds, and flat beats are some decent songs, as mentioned. Derulo doesn’t have the writing chops of someone like Ne-Yo, though, and he tends to rely on clichés and chewy lyrical concepts a little too much. The bulk of songs on Future History are club bangers, so content isn’t particularly of much significance. The lyrics on most pieces range from “searching for the one” to “finding the one” to “givin’ up on searching for the one.” There is a shift in “Bleed Out,” however, that has Derulo wounded after his bond with “the one” becomes frostier than Ann Coulter on a first date. Derulo becomes the 45,089th person to sample Toto’s “Africa” with his “Fight for You.” With lyrics that sound like they could’ve been inspired by The Karate Kid, the songster does his best with the gawky, tacky arrangement. A few yelps in the background had me persuaded Derulo was perchance fending off a ninja clan. Wishful thinking, I know. Samples are in abundance throughout Future History. “Don’t Wanna Go Home” consumes Robyn S.’s 1993 single “Show Me Love” and the refrain from Harry Belafonte’s 1956 hit “Day-O.” How devilishly contemporary! And “It Girl” is a refreshingly lean track that blows it when Derulo tells his blushing paramour that she’s more important than a Grammy. Let's not get carried away. 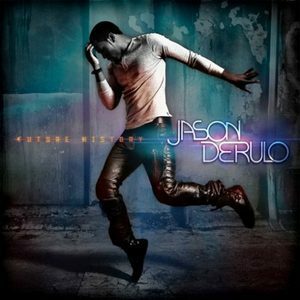 On the plus side, Derulo’s vocals are pretty good – when they aren’t being drowned out by Auto-Tune or effects, that is. He manages some emotion on “Be Careful” and is capable of some murkier sentiments with the aforementioned “Bleed Out,” my favourite track on the album. Overall, though, this is a substandard effort. It’s a letdown because the talent is muffled by feverish production, uninventive lyrics and a lack of risk. One would expect an evolution or, at the very least, a sense of adventure out of Jason Derulo, but his Future History is a pedestrian, unenlightening step back.